The green flame’s bored directions soon led the barbarian to a large tome, nearly four handspans in length, and almost as thick as Agnar’s arm. The cover was simple leather, embossed with an ornate representation of the Arkanic symbol, Knowledge. The Northlord found a quiet desk, hidden away in the towering stacks and set his guide down on the stand provided. The sprite brightened visibly, giving Agnar sufficient light to read. Opening the first page, a musty fume filled the air. Heady and thick, but not unpleasant. 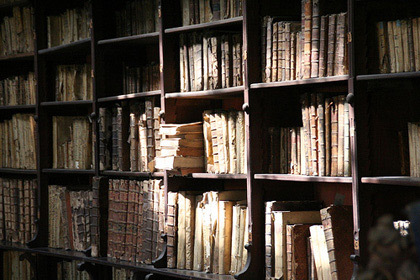 The scent of old books. The first page was filled with large block representations of several major Precursor symbols, a few of which Agnar found himself surprised to recognize. The numbers, and the symbol for Fire seemed to jump out at him. Turning the page, the barbarian found a simple rhyme. How’d they come, and where’d they go? Little boys and girls all want to know! Far and near, near and far! The green flame tried nobly to roll its eyes, before remembering that it didn’t have any. The next few pages are gorgeously illustrated with a series of landscapes. Primitive people going about their simple lives, farming and hunting. Agnar gazed critically at some of the spearmen — they were holding the weapons completely wrong. A time of darkness, fire and death. Monsters roam the land, killing and maiming the simple tribesmen. A shining knight, marked with the Precursor Sigil of Power — light shines from him in all directions, making the monsters flee. The simple people’s village rebuilt, but grander and stronger. The shining knights walk amongst the people, helping them build things, till the earth. The village is a grand city, with ships that sail through the air and towers in the clouds. Agnar stops a third of the way through the tome. The barbarian finds several pages missing, sliced neatly from the overall tome — the barest stubs of paper remaining at the center of the binding. The next pages showed fanciful illustrations of scholars and researchers looking through the ruins of Precursor structures, with descriptions of the undying wonders left behind by their civilization. Maybe you will solve the mystery! Maybe you…. one page had solemnly written. Next Post “Yes.” Izus said. I stopped by and read a little, and I’ve nominated your blog for the 7x 7 Link Award. Please stop by my blog to see the rules so that you can nominate seven other deserving bloggers. Congratulations and happy writing!